Intriguing in concept and (mostly) successful in execution. All in all, worth a look. The Community is your first responsibility as a Citizen. So says the First Edict of post-Reformation Sindra. Maribel is a new mother of twins in this bioengineered, telepathically networked society of comfort and safety, where the only relationship that matters is the one between a Citizen and her Community. But Maribel is also a scientist, and scientists follow facts-wherever they lead. Her search for the truth awakens emotions in her she never knew existed, uncovers ancient powers long hidden in Sindra’s history, and has the potential to destroy her Community. A dying planet . . . A desperate parent . . . A daring plan . . . IRRADIANCE is the story of Maribel’s choice. From its opening pages, Irradiance is a fascinating piece of work, containing both superb worldbuilding and well-realised characters. Naturally, then, there is much to like – particularly for lovers of dystopian fiction, to whom this book is aimed. At the same time, a handful of niggles keep the book firmly grounded in the realm of “good”; it’s a fun read, certainly, but not without its flaws. 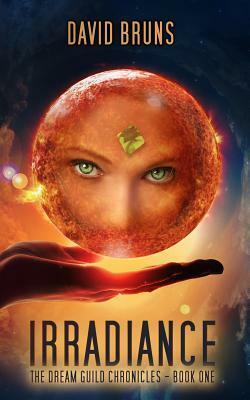 Irradiance presents us with Sindra, a world where everyone is linked by a combination of telepathy and technology. A Supreme Council holds total power, with reams of Control Officers acting to keep the people in line. Citizens who fail to conform, deliberately or otherwise, are taken away and “recycled” with few opportunities to make amends. Babies are grown in tanks with genes pre-selected by the state, ensuring homogeneity amongst the populace. The above summary barely scratches the surface of the book, by the way. Indeed, the book deals with everything from hyperspace travel to precognition to popular politics good ol’ fashioned prejudice. A huge number of plot threads and ideas vie for readers’ attention – too big a number, in fact. Various concepts end up going under-explored as a result, while the main conflict takes just a little too long to properly get going. Once things do get going, mind, the result is suitably exciting. Maribel and her family become closer and closer as events intensify, with the government hounding them at every turn. This eventually leads to a downright thrilling conclusion, which ends things in a way seldom seen in these kinds of books. I really grew to care for Maribel by the end, as well as for her family, friends and allies. All of them were distinct, being easy to both visualise and “hear”; traits which, incidentally, were shared by the villains. There were a couple of headscratchers near the end, mind. During a fight, a character seemingly forgets an ability they used before, making things far tougher than they should have been. At the same time, Maribel makes one particular decision which…didn’t make much sense, on reflection. These didn’t detract from the overall experience too much, and it’s possible they will be explained in the sequel, but I found them distracting nonetheless. Irradiance is certainly not perfect, but it’s by no means bad, either. Fans of dystopian fiction will like it, as will likers of science fiction in general. All in all, I’d say it’s worth a look.